As managed care organizations worked on how they could prioritize pricing over medical decisions they came up with various plans to “manage” how physicians prescribed medications. I was a member of two Pharmacy and Therapeutics Committees (P & T) that both had this as a goal. One of those committees had a much stricter mandate in terms of saving money. The basic strategy used by that committee was to place a drug “on formulary” or “off formulary”. If it was “off formulary” it was not available to any doctors within the HMO to prescribe. The idea that all drugs within a class that had the same purported mechanism of action ruled the day. As an example, all of the selective serotonin reuptake inhibitors (fluoxetine, paroxetine, sertraline, citalopram, escitalopram, fluvoxamine) would be considered equivalent medications and the committee would decide to place the least expensive ones on the formulary. At the time, the major controversy was fluoxetine because there was no generic brand available and the company that produced it was notorious for not negotiating prices with hospitals and health care systems. There was an eventual appeal by psychiatrists who presented to the committee on the unique qualities of fluoxetine. At the time it was the only medication studied in adolescent depression for example. Eventually a rule was passed that it was nonformulary for any physician who was not a psychiatrist. The total cost of the drug was more of a consideration than the absolute price. Very expensive drugs were approved that had questionable endpoints based on the fact that utilization would be low and that advocates for a particular untreatable illness would want it. So the decision of the committee and their mandate was to reduce the use of relatively more expensive drugs that would be used fairly frequently. In some cases, the off formulary drugs were available by “prior authorization” meaning that the prescribing physician needed to usually write up an appeal and fax it to the pharmacy or health plan and in some cases make additional calls. The health care business has a long history of introducing layers and layers of management driven largely by the amount of money involved. If you can successfully insert more management for even a small percentage of the available health care dollars you will potentially have a multi billion dollar business. The management of pharmaceuticals is no exception and the Pharmacy Benefit Manager or PBM was born. 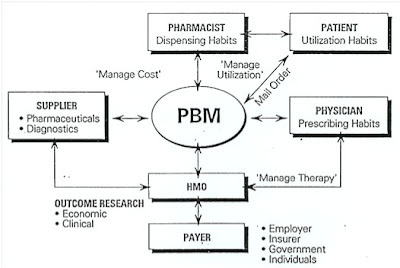 The task of the PBM like the task of a P & T Committee is to control the prescribing physician and force them to choose a medication based on the lowest cost. Individual variation between patients and all of the other variables that physicians have to take into account do not matter. If the physician or the patient thinks that they do – it will take a prior authorization for the alternate medication. The prior authorization fallacy is essentially the same as the utilization review fallacy. The most charitable interpretation is that it assumes that a person who is not necessarily a physician and who has no personal responsibility for your care can substitute their judgment based on a cost consideration. The diagram is also instructive in the way that the prescribing decision (and the dispensing decision) is trivialized as a "habit" rather than a decision that takes into account the evaluation and personal knowledge of the individual patient. Today all physicians are routinely subjected to prior authorization procedures that waste significant amounts of their time and the time of their staff in order to make seem like the PBM decision has some degree of medical legitimacy. The cost to medical practices is huge and completely unnecessary. If PBMs are really businesses there is really no legitimate reason that they need to include physicians in their decisions of what medication should be covered. They just need to plainly state that to their patients and deal with the public relations problems instead of wasting about one million hours of physician time per week. In the weeks that follow I will demonstrate just how far this business plan has infiltrated medicine and psychiatry and what the response has been to date. There is a seminal article in this month’s British Journal of Psychiatry by Leucht, Hierl, Kissling, Dold, and Davis. The authors did some heavy lifting in the analysis of 6175 Medline abstracts and 1830 Cochrane reviews to eventually compare 94 meta-analyses of 48 drugs in 20 medical diseases and 33 meta-analyses of 16 drugs in 8 psychiatric disorders. The authors have produced a graphic comparing the Standard mean difference of effect sizes between the general medicine drugs and the psychiatric drugs. It is apparent from that graphic that the psychiatric drugs are well within the range of efficacies of the general medical drugs. This is an outstanding study that merits reading on several levels. The authors have used state of the art approaches to meta-analysis following suggested conventions. They provide the summary of the studies reviewed and actual details of their calculations in the accompanying tables. (the document including references and PRISMA diagrams is 59 pages long.) They have a comparison of standard criticisms of psychiatric drugs and illustrate how the criticisms are not fair and the toxicity considerations are often greater in the general medicine drugs than the psychiatric drugs. This paper should be read by all psychiatrists since it is an excellent illustration of an approach to large scale data analysis using modern statistical techniques. It is a good example of the application of the discussion by Ghaemi of hypothesis testing statistics versus effect estimation. The authors also have an awareness of the limitations of statistics that the detractors of psychiatric care seem to lack. Their statements are qualified but they provide the appropriate context for decision making about these medications and the implication is that decision matrix is clearly squarely in the realm of other medical treatments in medicine. From the standpoint of the media and the associated politics it will also be interesting to see if this article gets coverage relative to the articles that have been extremely critical of psychiatric drugs. I can say that I have provided the link to the article by Davis, et al on the issue of antidepressant effectiveness to several journalists including the New York Times and it was ignored. The press clearly only wants to tell the story against antidepressants and psychiatric medications. Never let it be said that any aspect of psychiatric treatment gets objective coverage in the press. That problem and the lack of investigation of that problem is so glaring at this point that the press lacks credibility in any discussion of psychiatric treatment. S. Nassir Ghaemi (2009) A Clinician’s Guide to Statistics and Epidemiology in Mental Health: Measuring Truth and Uncertainty. Cambridge University Press, New York. Davis JM, Giakas WJ, Qu J, Prasad P, Leucht S. Should we treat depression with drugs or psychological interventions? A reply to Ioannidis. Philos Ethics Humanit Med. 2011 May 10;6:8. Seemuller F, Moller HJ, Dittmann S, Musil R. Is the efficacy of psychopharmacological drugs comparable to the efficacy of general medicine medication? BMC Med. 2012 Feb 15;10(1):17. Free full text commentary on the main article from another journal    -      download the pdf. I happened to start practicing psychiatry at a time when managed care was just starting to build momentum. From a political standpoint there was concern in the popular press that healthcare services were being over utilized. There is a famous study by the RAND Corporation looking into whether or not angiography and bypass surgery were being used to frequently to treat cardiovascular disease. There was a concern that medical and surgical procedures in general were being over utilized. This was part of the driving force for a large scale experiment called the Medicare PRO or Peer Review Organizations. In the late 1980s and throughout much of the 1990s I was a physician reviewer for the Medicare PROs, first in Wisconsin and then in Minnesota. My job was to look at cases selected from all psychiatric hospitalizations in the state and determine whether the total length of time in the hospital was appropriate for the condition and whether or not there were any associated quality problems. There was an extensive list of quality problems that nurse reviewers would identify and forward to me for further assessment. Examples of quality problems ranged from death on a psychiatric unit to abnormal vital signs at the time of discharge to the appropriate monitoring of the therapy like lithium that require close monitoring. All physician reviewers working for this organization had to be carefully screened for conflicts of interest. I could not review any case if I had any financial interest in the hospital or clinic where the incident occurred. At about the same time managed care companies were establishing utilization reviewers for their insured members. They had no quality focus or quality markers. Their only focus was whether or not one of their members was entitled to inpatient coverage or a specific course of outpatient therapy. There were no conflict of interest considerations because the reviewers were all paid by the managed care company and therefore their financial interests were aligned with the corporation. You could consider the two different forms of utilization review to be the great experiments in the provision of medical care in the 1990s. More appropriately the Medicare PROs were probably the experimental side and the managed care utilization reviewers represented a business model that really required no experimentation. It seemed quite obvious that if you could deny care that you would make more money. What happened to these two models over the next 10 years? Despite the rigorous screening and structurally defined quality problems used by the Medicare PRO, at one point it was determined that the amount of over utilization found in the state of Minnesota was not enough to justify the cost of the program. After all of the hype in the press about how physicians and hospitals were providing unnecessary care, that was a stunning finding on such a large scale that it should not have been ignored. It essentially meant that from an objective scientific standpoint utilization review is unnecessary. Minnesota stopped its utilization effort and decided to partner on the quality side with health care organizations to improve the treatment of specific conditions. Psychiatry has been hit particularly hard by this quasi-quality approach that disproportionately rations care to psychiatric patients. We are currently seeing people with complex disorders like unstable bipolar disorder discharged from psychiatric hospital within a few days because the "crisis" is over and yet they are not able to function by themselves at home. We have allowed managed care organizations to essentially dictate a standard that suggests the only reason that a person should be a psychiatric unit is if they are "suicidal" or a threat to others. There is broad interpretation of what "suicidal" means and of course the physician reviewer for the insurance company has never personally assessed the patient or their circumstances. The vast majority of patients who would benefit from quality care in a hospital would not meet either of those criteria and frequently have no other resources. The fallout from this approach has been tremendous. Psychiatric care in hospital settings is generally viewed as being very poor in quality. Many outpatient psychiatrists I have consulted with have told me that there is essentially no place that their unstable outpatients can be stabilized because they are frequently discharged from hospitals in a few days and the treatment has not been changed. There is little collaboration between inpatient and outpatient psychiatrists because of the need for high turnaround and the time constraints. The actual inpatient environments are frequently so toxic that people with fairly severe problems don't want to be there. Managed care is focused primarily on providing high-volume, low quality care by the application of a method that has no basis in reality. It is good to see the APA finally taking a stand on this issue. Antidepressants and the psychiatrists who prescribe them have been taking a pounding in the popular press for years. The main proponent here was also featured in a Newsweek headline story two years ago. This is a prototypical example of how the media and special interest groups can distort science and facts and politicize the discussion that must be nuanced. The problem is that you have to know something and be fairly free of bias to participate in a nuanced discussion. Like most issues pertaining to psychiatry, the issue is always polarized and poorly discussed in the media. I got involved in this issue as a managing editor of an Internet journal and I solicited a paper from a world renowned epidemiologist to get his current view on antidepressant meta-analyses. In order to present the entire argument I also solicited response from a world renowned psychopharmacologist with broad expertise in this field. Both articles are available online for free and I think if they are both read in total they represent the most accurate picture of antidepressant response. Both references are listed at the bottom of this page. A final dimension that is critical in the analysis of any source is potential conflicts of interest. The only conflict of interest that is typically discussed is the financial interests of authors and pharmaceutical companies in producing positive trials. That ignores the fact that many of these trials have been very public failures and that post trial surveillance limits the use of some of these compounds. There are other conflicts of interest to consider when an author is selling a viewpoint and can potentially profit from it – either financially or politically. The APA could provide a valuable service here in making the documents from the FDA and the EMA widely available for public discussion and analysis. “60 Minutes” Segment on Antidepressants "Irresponsible and Dangerous" – APA New release Febrary 22, 2012.
from a thousand randomized trials? Philos Ethics Humanit Med. 2008 May 27;3:14. The New York Review of Books this week contains a review by Diane Ravitch entitled “Schools We can Envy”. In it she reviews “Finnish Lessons: What Can the World Learn from Educational Change in Finland?” by Pasi Sahlberg. As expected, blaming the teachers is currently popular in the United States but it does not fly in Finland. And what implications does this have for blaming the doctors? I could easily make the argument that the variance in patient outcomes for a particular physician is probably much less under the control of that physician than the variance in student outcomes for any teacher. It is time to let the public know that the "report cards" on doctors is another poorly thought out idea from the government and the managed-care cartel and they are probably even less valid than report cards on teachers. I will provide all of the details in subsequent posts. How Can Psychiatry Save Itself? The front page article of the Psychiatric Times is Ronald Pies article: “How can American Psychiatry save itself?” The only thing more excruciating than watching a well written article stretched across 7 pages of drug ads is the rehashing of what are essentially political arguments against the field. DSM 5 – good or bad? Lack of objective markers, lack of a biological basis of behavior or an adequate description of the phenomenology, yada, yada, yada. The articles about a $3.5 billion shortfall in funding state mental health programs and the elimination of psychiatric services at Cedars-Sinai stand in contrast to the science and philosophy of what is wrong with psychiatry. Ever since I became a psychiatrist, I have been impressed with the levels of self flagellation in the field. Psychiatrists will provide any number of debates about what is wrong with the field and in the more extreme cases agree with any scapegoating of the field based on the behavior of a few. We also seem to have the largest number of experts who want to make a living out of critiquing the field. A good comparison would be with our colleagues in Cardiology. There is currently a boom in implantable pacemakers and implantable cardioverter defibrillator devices (ICDs). The widespread use of many of these devices is at least as controversial as anything in the field of psychiatry and yet compared with the 2100 hits that Dr. Pies got when he Googled “psychiatry is in trouble” – I got NOTHING for “cardiology is in trouble”. I can go on to pulmonary vein isolation by either radiofreqency or cryosurgical ablation for paroxysmal atrial fibrillation as controversial measure number 2. It would not stand the scrutiny that the FDA gives antidepressant drugs. And yet while psychiatrists are ridiculed for using antidepressant drugs, nobody blinks an eye as hundreds of thousands of afibbers get ablation procedures every year despite the fact that reviews describe a 20-30% immediate recurrence rate and a long term recurrence rate of 9% per year. There have also been no commentaries on the fact that nobody knows what an ablated left atrium looks or functions like 10 – 20 years down the road. I generally like what Dr. Pies writes. I like his incorporation of philosophy in his articles. I like the way he refutes the common rhetoric used against us. I am awaiting his suggested solution in the second article in this series and hope he has concrete suggestion to refute the rhetoric against us and expose the fallacy that there is more wrong with psychiatry than there is with Cardiology – even though the Cardiologists have all the procedures and they tend to get paid for their work. But let's face it - psychiatry's longstanding obsessions about whether or not we measure up to the rest of medicine should have been put to rest a long time ago. That was when we became and still are the last hope for large groups of people with severe mental illnesses. Our record of improved treatment in this group of patients ranks with the best treatment achievements in medicine. Why I don't use the term "Behavioral Health"
It was obvious to me from day one that this was a business strategy. When I worked in a hospital I wore a standard white coat and embroidered under my name was the word PSYCHIATRY. I was after all a board certified psychiatrist and every other doctor in the place had their specialty under their name. One day back in the early 1990s, my boss summoned me into his office and said that were were going to replace PSYCHIATRY with BEHAVIORAL HEALTH. After all we did not want to alienate the non psychiatrists working in the department who work on our teams. Something about that explanation did not add up. The other specialists also worked on teams and did not change the name of their specialty to match the function of the team. Besides the term MENTAL HEALTH was a perfectly respectable term that all of us had worked under for decades. What was the push for BEHAVIORAL HEALTH? Now we all know that it was part of a business strategy to marginalize professionals and make it seem like a business strategy was somehow good for mental health and psychiatric treatment. I told my boss that if I was board-certified in behavioral health it might make sense, but barring that I would stick to PSYCHIATRY. He agreed but over the years that followed the term BEHAVIORAL HEALTH has penetrated the marketplace even in the public sector. More importantly the associated management strategies have led to rationed care and access to care as well as lower quality of care for all person with mental health problems. There has been some movement toward renaming BEHAVIORAL HEALTH UNITS to MENTAL HEALTH UNITS. But I haven't seen that in the Twin Cities or Midwest yet. I wrote this original article in 2005 for the Minnesota Psychiatric Society newsletter in response to two developments. First, it is one of the only articles that you will ever see quoting actual prices in terms of bills and what the actual reimbursement is. Contrary to the myth of expensive health care, I have had people tell me how shocked they were at how little of a bill the insurance company actually paid. The author here gives the actual dollar amounts. Second, there is an obvious boom in Cardiology services at a time when psychiatric services were being strictly rationed according to managed care "carve out techniques." At the time this article was originally written 100,000 patients per year received implantable cardioverter devices (ICDs) at a cost of $2 billion and a pulse generator replacement cost of an additional $1.4 billion. Using the figures from this article that is the equivalent of 794,000 psychiatric hospitalizations per year. The original article and the reference begins with the paragraph below. 1. Minnesota (a state with maximal managed care penetration) - has 40% fewer mental health beds per capita than the nation. 2. In the past 5 years - 5 new cardiac care facilities have opened at a cost of $263 million. "A look at Medicare cost data for one local hospital shows why. It cost United Hospital $8,091 to implant a pacemaker, but the hospital received $11, 538 for each procedure, according to 2003 data provided by the American Hospital Directory. On the other hand, it cost United $10, 132 to treat a patient with psychosis, but the hospital received only $4, 282 per case. These are federal Medicare figures but the same disparities exist in payments by private health plans." That's why you are seeing all of those shiny new Heart centers and no new psychiatric hospitals. Combined with the psychiatric outpatient penalty - it probably also goes a way toward explaining why the system is so fragmented and the seriously ill cannot find a psychiatrist. Also notice that the insurers were described as worried about how to contain Cardiology costs, but the reality here is that all of these Cardiology services are owned by the major managed care companies. Hauser RG. The growing mismatch between patient longevity and the service life of implantable cardioverter-defibrillators. Journal of American College of Cardiology 2005; 45 2022-5. Imagine working in an environment that is optimized for physicians. There are no obstacles to providing care for your patients. You receive adequate decision-support. Your work is valued and you are part of the team that gets you immediate support if you encounter problems outside of your expertise. In the optimized environment you feel that you are working at a level consistent with your training and current capacity. That environment allows you to focus on your diagnosis and treatment of the patient with minimal time needed for documentation and coding and no time wasted responding to insurance companies and pharmacy benefit managers. As I think about the problems we all encounter in our work environment on a daily basis I had the recent thought that this is really a management problem. Most of the management that physicians encounter is strictly focused on their so-called productivity. That in turn is based on an RVU system that really has no research evidence and is clearly a political instrument used to adjust the global budget for physicians. Current state-of-the-art management for physicians generally involves a manager telling them that they need to generate more RVUs every year. Managers will also generally design benefits and salary packages that are competitive in order to reduce physician loss, but this is always in the larger context of increasing RVU productivity. Internet searches on the subject of physician management generally bring back diverse topics like "problem doctors", “managing physician performance”, "disruptive behavior", “anger management”, and “alcoholism”, but nothing about a management plan that would be mutually beneficial for physicians, their patients and the businesses they work for. In my research about employee management I encountered the work of the late Peter Drucker in the Harvard Business Review. Drucker was widely recognized as a management guru with insights into how to manage personnel and information going into the 21st century. One of his key concepts was that of the "knowledge worker". He discussed the evolution of managing workers from a time where the manager had typically worked all the jobs he was supervising and work output was more typically measured in quantity rather than quality. By contrast knowledge workers will generally know much more about their work than the manager. Work quality is more characteristic than quantity. Knowledge workers typically are the major asset of the corporation and attracting and retaining them is a corporate goal. Physicians are clearly knowledge workers but they are currently being managed like production workers. The mistakes made in managing physicians in general and psychiatrists in particular are too numerous to outline in this essay. The current payers and companies managing physicians have erected barriers to their physician-knowledge workers rather than optimizing their work environments. The end result has been an environment that actually restricts access to the most highly trained knowledge workers. It does not take an expert in management to realize that this is not an efficient way to run a knowledge based business. Would you restrict access to engineers and architects who are working on projects that could be best accomplished by those disciplines? Would you replace the engineers and architects by general contractors or laborers? I see this dynamic occurring constantly across clinical settings in Minnesota and it applies to any model that reduces psychiatric care to prescribing a limited formulary of drugs. I think that there are basically three solutions. The first is a partial but necessary step and that is telling everyone we know that we have been mismanaged and this is a real source of the so-called shortage of psychiatrists. The second approach is addressing the issue of RVU based pay directly. I will address the commonly used 90862 or medication management code. As far as I can tell people completing this code generally fill out a limited template of information, ask about medication side effects, and record the patient's description of where they are in the longitudinal course of their symptoms and side effects. Many managed care companies will ONLY reimburse psychiatrists for this stripped down intervention. I would suggest that adding an AIMS evaluation or screen for metabolic syndrome, an in-depth probe into their current nonpsychiatric medications and how they interact with their current therapy, adding a brief psychotherapeutic intervention, case management discussions with other providers or family, and certainly any new acute medical or psychiatric problems addressed are all à la cart items that need to be assigned RVU status and added to the basic code. Although there are more, these are just a few areas where psychiatrists add quality care to the prescription of medicines and managed care companies do not. The final solution looks ahead to the future and the psychiatrist role in the medical home approach to integrated care. We currently have to decide where we fit in that model and make sure that we don't end up getting paid on an RVU basis while we are providing hours of consultation to primary care physicians every day. Overall these are political problems at the legislative, bureaucratic and business levels. It should be apparent to anyone in practice that when political pressure succeeds in dumbing down your profession – it necessarily impacts adversely on your work environment, compensation, and most importantly your ability to deliver quality care. I thought that a blog written by a psychiatrist who has no stake in bashing psychiatry and who has successfully treated patients for over two decades is long overdue. In the absurd world of today's media and their completely unrealistic portrayal of psychiatry and psychiatrists, political arguments can be advanced against the field and that leads to a rapid acceleration of bashing of the field fueled by others who frequently don't know a thing about psychiatry. I plan to post a few examples in the days that follow about that process and also about the political motivations for that process. I also do not want to set myself up as a guru or somebody who is unique. That is often the viewpoint taken by critics of the field. At this point in my career, I personally know hundreds of technically competent psychiatrists who are every bit as skilled as me. In fact, I like to provide the example of a patient who came to see me for geriatric consultation. At the end of the visit she produced a previous evaluation from a colleague who trained with me at the University of Minnesota. That note right down to the diagnostic evaluation and plan was identical to what I had in my handwritten notes to that point. Finally, the viewpoints expressed here are probably not mainstream psychiatry. Psychiatrists in general like to avoid conflict and attempt to resolve problems in a non confrontational manner. Physicians in general seem to ascribe to this tactic. While I agree completely that it is necessary to be neutral in all interactions at a clinical level, that does not extend to politics - especially in an era where an activist government and a managed care cartel are restricting psychiatric care at a much higher rate than they are restricting access to medical and surgical care. What follows here is strictly my opinion and not the opinion of any of my current or past employers or of my professional associates.